Our arrival in this world from our mother’s womb goes unnoticed, or at least forgotten by us. We are born bearing the karmic links of our previous lives and with a script for this life which we have not read. Is our part in this play a fleeting one or a main role? It is revealed day by day, hour by hour, second by second. Let us not deceive ourselves that we are guaranteed a long life. We all know someone who has died; sometimes ‘before their time’. Well, perhaps we should revise that to ‘before we expected’, because every one of us will die at our allotted time. The Masters have told us that the most important thing we can do on this earth is to attend to our meditation, because when we draw our final breath that is the only thing that will really count. Have we knocked at the Lord’s door each morning and prioritized that attendance over everything else? That was our promise at the time of initiation. It wasn’t to keep fit; to have a big group of friends; travel the world or devote ourselves to our career. It was simply to sit down, at a regular time, for two and a half hours, to remember and be with him. Many of us, perhaps in our work life, family life or even social life will have experienced the satisfaction of a job well done – a work presentation; arranging a family celebration; or maybe to meet up with old friends. When those preparations come together successfully we celebrate our success. To experience success of a different kind, do not underestimate the importance of living each day in his will. If we can do that we will make steady progress and tread lightly through our lives. Prepare! The thirteenth-century Sufi mystic, Shams-e Tabrizi, reminds us in the book of that name that death is a reality for which we should prepare by overcoming attachment to this world. When the soul became involved with form and developed affinity for it, the upper door closed. The soul was left with no liberty to return to the other side. It perceived, for example, wealth, respect, wife, friend, and partner, and it experienced many pleasures on this side. Thus, it became inclined towards this direction. Now it feels a thousand deaths if someone even mentions dying to it but, if it could only see the wonders of the other world, it would be eager to go there. Seeing that, dying would not be viewed as death, but rather as life. These words are a clear mirror in which you can find a complete reflection of your own state. If you are ready for death in whatever work or condition you choose, then that is good. When you cannot decide between two occupations look in the mirror and ask which is worthier of death. You must either sit like a clear light, receptive and waiting for death, or strive intently to receive this state. The path of the Masters really is simple. The philosophy is simple. The instructions are simple. What we are asked to do is simple. There is no reason that our lives should not be simple. We have been drawn to a living Master and he is taking us to our true home. First, in following this particular spiritual path, we do not have to have any special qualifications, go anywhere, learn anything difficult or pay anything. Second, yes, there are things we are called on to do. But once we have settled into the routine of a lacto-vegetarian diet, abstinence from alcohol and mind-affecting drugs, a good moral life and daily meditation, these – far from being a complication – keep life straightforward. Third, our days of searching are over. In fact, it was never our searching which brought us to the path. It came to us when we were ready. Fourth, our progress is inexorable and we will surely move forward. We do not have to make value judgements about our progress once we are attached to the Master and are following his instructions. Fifth, our inner connection with our Creator is made ‘live’ when the Master initiates us and puts us in touch with that primal energy, the sound current, which is the energy of the Creator. We can actually hear and identify this sound current and we automatically follow it towards our eternal home. Attachment to the sound current is the certain way to leave this creation forever. Finally, although we do not always recognize it, the love and care of the Master is always there. Everything is under his charge. It is our minds that generate complexity. Complexity is a distraction. Complexity is in the nature of the creation, and to be submerged in complexity is to be of the creation. Simplicity is of the spirit, and is a quality that belongs to love, and love is our relationship with the Creator to whom this creation and all in it belong. Do we owe anything at all to complexity? For example, let’s ask ourselves whether we are at the Master’s door because we have a complex intellect that uniquely unravelled the mysteries of the spiritual worlds. Is it because our complex financial investments have brought us great wealth? Have we searched through the world to find hidden ancient manuscripts? Has it been passed on to us by a previous generation as an automatic family inheritance? It is none of these things. The Creator is simply calling us back home like a mother who calls to her child playing in the garden to come in and clean up. The only difference in principle is that the directness of the call registers with the soul, not with the conscious mind, and therefore we may be aware, at a conscious level, only of the stirrings of dissatisfaction with this world. There is something we need to know – that a living Master is essential to succeed on this journey. But how are we supposed to find a Master? How do we recognize him? Isn’t the world full of so-called masters and gurus? But what about free will, we could reasonably ask. Love founded on compulsion or love which is a dependency surely isn’t love. Let us go back to the example of a mother calling her child in from play. She knows that the night is coming. She knows that the child will need to be fed and washed before bed. If the child does not come after being called a few times, what happens? The mother will go to find the child and if it still won’t come readily, she lifts it up and carries it in, probably screaming and kicking. To the child, this isn’t love. This is a harsh dictator spoiling the games. But we all know that the mother is driven by love for the child. She cares for it at every level – even levels of which the child is completely unaware. And so it is with the Creator and his care for us. Rapid progress under the guidance of the Master would clearly be possible if we consisted only of soul, the divine essence in each one of us. But the Creator decreed that we take on mind and physical form to operate at the physical level. He also organized the created worlds on the basis of scrupulous fairness and justice. We are told that a detailed record is kept of all actions, the effects of which must be accounted for at some time, either in a current or future life. No soul can leave the creation without its karmic record being in balance. If one considers the enormity of stored karma from millions of lives, for all practical purposes a soul is trapped here unless there is some intervention of grace. In other words, we have to have our account cleared – only possible with the help of the Master – before we can finally leave, never to return. We do not need to understand the intricacies of karma but we do need to be grateful and show that gratitude by fulfilling the vows we make at initiation to the very best of our ability. When we are initiated we make four promises, and failure to observe any of these cuts at the root of spirituality and inhibits further progress. The first three form the foundation for the fourth. Our fourth promise, to sit in meditation, is the simplest feature of the path, but it is the core activity for us. It means we have some work to do. Simple work, but work all the same. We undertake to allocate a minimum of two and a half hours every day to meditation, for the rest of our lives. The meditation must be carried out in the way described at initiation, giving the first period to simran or the repetition of the five holy names, and the second to bhajan or listening to the holy sound reverberating at the eye centre. The Masters sometimes use the allegory of travelling home in the dark and listening for the sound and watching for the light of our house, then following that sound and light. It’s simple to understand but not so easy to achieve the desired result of stilling the active mind. So, consistent with that simple message, when we accept the wake-up call to go home, we should keep our lives simple. By simplifying our dealings with the world and involving ourselves in essentials only, we can make it much easier to gather in our attention at the time of meditation. We have found that all essential aspects of this path are simple. Intellectually understanding the complex issues of the meaning of creation or the technicalities of karma are not essential, and we do not need to understand or delve into them. In due course, at an inner stage of our journey, we will come to know these things. For now, we can and should keep it simple, keep it basic, and then everything can flow in the easiest way. Take life easily as it comes. If we are beset by adversity of whatever nature, we can remind ourselves that this too shall pass and that the Master is making that adverse event as painless as he can, commensurate with the eradication of the karma. Attendance to meditation and simran during the day will help us to develop the strength to be unaffected by our karmas. Remember the screaming child who did not want to come when its mother called? Let us make sure that we are not like that. We must have some trust and faith in our Master. We should remind ourselves that a higher power is guiding our destinies so that we move along within the will of the Master. He alone knows what is best for us. He has our highest and best interests at heart. He is good and merciful and we can rest in his hands. Q: Would you say that an attitude of inner contemplation, reflecting on God, thinking of him, of his kindness and love, also has value in some way? A: That’s right. That will automatically induce you to do simran. That will help you to do simran, naturally. Q: Often I feel like I could do simran more, but I’m afraid that somehow things are going to get out of hand unless I’m really concentrating on what I’m doing. A: No, only at the time of meditation you should attend to simran with concentration.… When your mind is occupied, how can you do simran, unless you have reached the stage where it goes on automatically in your subconscious mind? Q: There are some jobs where you either have to actively use your mind all the time or you have people coming at you all the time with questions.… I absolutely cannot do simran under either of these circumstances. A: Sister, one has to adjust one’s daily activities.… We have to fulfil certain responsibilities, certain obligations, but still we have so much spare time when we unnecessarily make ourselves miserable by thinking. At least that time should be spared for simran. We’re not constantly busy with work. Q: Doesn’t the simran revolve twenty-four hours a day in one’s head once one gets advancement? Even when one goes through one’s pralabdh karmas, doesn’t the simran revolve? A: It can if one is in the habit of doing simran. Then even unconsciously one is doing simran. You get into the habit of doing simran so much that even unconsciously you are attending to it. Q: Does the Master do it for us in those circumstances? A: You mean the Master should do the simran and you should just feel free? Q: Only when we can’t do it. A: Do we ever do it? We are only an instrument to do it. The Doer who’s forcing us to do it is always there. A: Doing simran is better than the conversation. If you don’t want to do simran, then you can converse. But simran should have preference over conversation. Q: Master, when one realizes that he is helpless, what should be his next move? A: The next move is to sit in meditation. When one finds that he’s absolutely helpless, then he should really become helpless and submit himself to meditation and leave his intellect. That’s the only move one should make. When was the last time you called yourself an idiot? Was it when you went upstairs to get something but couldn’t remember what it was? It was only when you came back downstairs to the room you started in that you remembered and thought, “What an idiot!” Or perhaps you filled your car up at the petrol station only to realize you’d left your wallet at home. Then of course your wife had to come out and bring your wallet to you, at some unearthly hour of the morning, before she was ready for the day. What an idiot. You must have temporarily taken leave of your senses! But what about your spiritual life? Are you an idiot there? The word “idiot” comes from ancient Greece, where it was common, even expected, for people to be involved, engrossed, in politics and society. This didn’t just apply to the educated, the intellectuals, but to everyone. It was so common in fact that if you weren’t fully active or involved in politics or society you were deemed to be ignorant and the name for such a person was an idiot. Using the same kind of thinking, Sufi mystics who had adopted a path of love rather than narrow-minded religious doctrine, sometimes called themselves ‘idiots’. From our point of view – the point of view of someone who is not enamoured with this world, who isn’t fooled by its passions or attractions – being this type of idiot is exactly what we want to be. We want to be unattached to the world and that’s why we are students of Sant Mat. Everyone who decides to work on himself is an idiot in both meanings. The wise know he is seeking reality. The foolish think he has taken leave of his senses. We are vegetarian to minimize the karmic debt we create in this life. We abstain from alcohol, mind-affecting drugs and tobacco products because we want to still the mind to enable it to focus within, not agitate and stimulate it. We live a good moral life – again, to minimize the karmic debt we create but also to set the tone of our daily life. How can we relax and settle into contemplation if we are constantly looking over our shoulder in anxiety or guilt? We meditate to focus our mind, bringing the attention to the eye centre to contact the inner melody of Shabd, so commencing our journey to self-realization then God-realization. We do all this under the instruction and guidance of a Master because we need the help of a realized soul to guide us in this life and beyond. It is the Master who has told us of the bliss that awaits us as we travel this path – the inestimable joy of union with Shabd, the audible life stream, the eternal life-force that created and sustains everything in this world and beyond. Let’s now look at how we get on. We have found a Master (or rather he has found us) and we have received initiation. Our first challenge, after satisfying our intellect sufficiently, is to commit to the practice wholeheartedly – not necessarily without reservation as we will always have doubts until we gain experience for ourselves – but fully, with all the determination and courage we can find. Abraham Lincoln put it perfectly when he said, “Commitment is what transforms a promise into reality.” We now have to show our commitment to our Master. The Masters are role models for us. They show us the way and give us the key (our meditation) with which to unlock the inner door, the third eye that is the gateway to our inner self, our true self. So we know the objective and we know the methodology to achieve our objective and we set forth, putting our best foot forward with all the joy and expectation of the start of a great journey. But, for some of us, after a period of practising the path without any apparent success, that excitement and sense of commitment wanes. The frustrations, the questions, the doubts begin to arise. Why do these questions creep in? Perhaps because we are still walking this path with our minds. We can’t shake off or rise above the belief that we must be able to own something intellectually before we commit to it. That this is something that we control, we drive, we achieve. If at this point we allow ourselves to become discouraged, we are in danger of becoming the first kind of idiot – someone who makes one of life’s big mistakes. It’s as if you knew someone who had been given a winning lottery ticket worth billions and he was told all he had to do was take it to the vendor who issued it and he would be given the all-important cheque. However, the outlet may not be open when he gets there so he’ll have to knock on the door and wait for it to be opened. It may not open straightaway but if he keeps knocking it will eventually open up. He’ll probably get an indication it’s about to open when the lights start coming on and he can hear the music inside that always plays. So the fellow goes to the shop and knocks but there are no lights on and he can’t hear any music. If that person gets tired of knocking, or doesn’t see any lights or hear any music, and after a while thinks, “Oh, I can’t be bothered with this any longer,” what would you think of them? You’d probably think, “What an idiot!” In just the same way, if we, after being given the opportunity of a lifetime to realize our true potential, to escape the cycle of birth and death, to abide in a state that knows no pain, no conflict, no envy, no jealousy, no anger, no desire only pure unadulterated love, and we fail to grasp this opportunity – we fail to follow the principles upon which our quest for realization is based – what should we be called? “Idiot” would be putting it mildly. The wrong sort of idiot! So we come back to the question, are we idiots? The answer seems to be, one way or another, yes, we are. We can be idiots for thinking we can understand the path with our mind; we will also be idiots if we do not seize the precious opportunity we have been given to re-unite with our source. Or we can be idiots (the other kind of idiot) for being detached from the world and its snares and for following a spiritual path. When the nineteenth-century Russian writer Fyodor Dostoyevsky set out to depict a character of true goodness and open- hearted simplicity, he chose The Idiot as the title for his novel. He was following the ancient Greek meaning of the word and indicating what the world thought of the central character. At the end of the novel, this man retreats from the society that has misused him and goes into a sanatorium. Is the truly learned one. If connecting with the eye centre and learning love makes us an idiot then I guess the trick to walking this path is making sure that we are indeed this kind of idiot! The guru sat in meditation on the river bank when a disciple bent down to place two enormous pearls at his feet, a token of reverence and devotion. The guru opened his eyes, lifted one of the pearls and held it so carelessly that it slipped out of his hand and rolled down the bank into the river. Do not attempt to possess things for things cannot really be possessed. Only make sure you are not possessed by them and you will be the sovereign of creation. The saints’ teachings are free, like all the other bounties of nature such as air, water and sunlight. A true spiritual teacher, therefore, never charges anything nor does he accept donations for his teachings. In this life our breaths should be used wisely and in such a way that as they decrease in total, we increase in our love for the Master and the Lord. It is love alone that counts in the kingdom of the Lord. We only have limited energy, and time is fleeting. The Master tells us that our breaths are numbered. Let us consider these breaths to be the same as money sitting in a bank account, a finite sum of fixed capital, gifted to us at birth. The funds – our breaths – can only leave the account, and we can earn no further income to top it up. Therefore each day the account only gets smaller and smaller. In addition, we never receive a breath statement; we have no idea at any time (from birth onwards) whether we are rich or poor. We will only know what is in the account when we draw our last breath – then the account is at zero and we die. And so for this life the ‘breath account’ is closed. So we should carefully spend what breaths we have wisely. As we only have a fixed amount of breaths, then it would be prudent to ensure that they are used in order to secure for us that single most valuable purchase available only in human life – liberation of our soul. To use our precious breaths in exchange for anything else except this would mean we will leave this world truly empty-handed. It is natural to experience periods of failure. These are inevitable and even very necessary on the road towards any success. While striving to improve our current situation, inevitably we will experience difficulties, temporary setbacks or periods when progress seems to have stopped. We just need to keep on putting in the effort – that much is in our hands. As travellers on the spiritual path we have the Master’s absolute assurance that there are no failures in Sant Mat. With that guarantee we can forge ahead with confidence knowing that in the end, with his grace, we will reach our spiritual destination. With the Master at the helm of the ship of our life, we will reach the distant shore. Storms may come, we may drift, or flounder, or we can feel becalmed and directionless in an ocean whose distant shores we cannot even comprehend. But the Master will carry us home. He will ferry us across. He intimately knows us, he understands the ways of the ocean of phenomena, he knows its depth and the forces that make it swell and rage. He knows the faithful winds that will carry us homeward as well as the bright beacons of navigation that will illuminate our way. We are not the ones in control, we are not the captains of our ship – he is. We simply need to have faith in his orders and keep within his commands. Our true priority is God-realization. Everything else in our lives should support this one clear objective. Our meditation is the chief means of fulfilling this objective, and so it should never be missed – not for one day. If we have meditated today, then we have done what God has wanted from us and we have fulfilled our promise to him. If instead we present him with a list of other good and wholesome tasks that we have performed – but we have not done our meditation – then the day has been wasted and precious time lost. Great Master said, “If you can’t bring me your success, bring me your failure.” He is telling us to put in the effort, and leave the results in his hands – he knows best. When we were initiated the Master took responsibility for our liberation, and as a loving Father he would never ask us to do something that was impossible for us to do. Our perception of failure is the outcome of our misplaced expectations that results will come immediately. The Master knows best when to give and what to give. He knows how many breaths we have left in our account. Our duty is simply to attend to meditation. This is how to live wisely. We cannot escape the dangers which abound in life without the actual and continual help of God; let us then pray to him for it continually. How can we pray to him without being with him? How can we be with him but in thinking of him often? And how can we often think of him, but by a holy habit which we should form of it? You will tell me that I am always saying the same thing; it is true, for this is the best and easiest method I know. Are we living to die, or dying to live? We probably think we’re alive, and in the usual sense of the word we are. We’re alive to our day to day life, and often this means we become so absorbed with everything we see and do in this world that we’re dead to the spirit within. For most, life is an existence of a purely earthly nature; we’re aware only of the mind and body. In turning to this world, we’ve turned away from the truth. And this is why the spiritual Masters come, for those who genuinely seek the truth. Having complete knowledge of the spiritual truth they can help us. They are experts in their field. They teach us how we may die to live whilst still in this world – how to conquer death to live in the Word of God, which is within all living things. In the human form this becomes apparent at the eye centre as sound and light. Referring to this the Bible says, “If thine eye be single thy whole body shall be full of light.” In coming to the single eye, as Christ put it, we close the two eyes, and detaching from the world, focus the attention within – then there is nothing but light in the body. This focused attention must be steady, because if our focus is not steady, our attention scattered – drifting with the thoughts and attachments of the mind – we will find only darkness in the body. Scattered attention results from our living under the veil of maya (illusion), which is projecting all that changes and is unreal, thus covering the eternal truth. This truth, a never-ending divine love, has many names – Shabd, the Word, Logos or the Holy Spirit; all these names describe the same creative power, a divine energy emanating from the Supreme Lord and taking us back to him. It seems as though we lost our way and, in turning to the world, we looked away from the Lord. Our awareness of Shabd’s light gradually faded; the darkness then further increased over many lifetimes owing to our excessive indulgence in the passions. And whilst we remain in darkness we cannot see this truth. This truth, the Masters tell us, is so close it’s like holding treasure in the palm of our hand and not knowing it’s there! Their experience of this truth means they can help us realize this treasure too – a higher, finer awareness, from human flesh to spiritual being. It’ll come as we die to the limitations of our earthly nature – our existence no longer confined to mind and body. To die to these limitations requires balance. Kahlil Gibran says: “Now you are suspended like scales between your sorrow and your joy. Only when you are empty, are you at standstill and balanced.” And this is why the Masters advise a life of high principles and daily meditation, so we may empty ourselves and come to balance. However, even in an unbalanced darkness, meditation helps us go through this life of ups and downs with composure; helps us keep a level-headedness in even the most difficult situations; helps us to be on our guard against earthly temptations. As our balance develops, we slowly edge our way toward the realization of that hidden treasure. Life’s ups and downs will remain because, as Tulsi Das says, “As is the action, so is the reward”. Likewise, in the Bible, “As you sow, so shall you reap.” In this world karmic law governs us. This law is meticulous and just and shows that a man’s destiny is the result of his own actions. If we sow seeds of love, kindness and generosity, we’ll reap this treatment from others, and if we sow seeds of anger, jealousy and selfishness this treatment will come back to us. After many lifetimes of sowing these seeds, spreading outwards in many directions, our karma will have pulled us away from the Lord within. Clearly, we don’t want to sow any new seeds and to this end the Masters say it’s essential we follow specific lifetime promises. We must be lacto-vegetarian – ensuring we’re not part of the chain of cruelty and killing created by the desires of the palate. No alcohol, mind-altering drugs or tobacco products are to be used – these befuddle our mind and we need to keep our sense of discrimination intact to avoid behaving inappropriately. And we must lead an upright moral life; this principle encompasses all decent and good behaviour. All the Masters emphasize how we must exemplify all that makes us good human beings. These promises set a clear strategy and build a solid foundation for keeping our promise to give at least one tenth of every day to meditation. Meditation is a daily spiritual journey and, as with any journey, if we keep stopping, it simply takes longer. And this journey is a journey intimately known to our heart. By turning to the Lord, we travel deep within ourselves, leaving this world of appearances for the world of reality. The mind stills, as the consciousness withdraws from the body, and rising to the eye centre comes into contact with Shabd. In contrast to this we often hear it said that progress seems slow; this is merely our perception, because with every effort we make in turning to our Lord, we grow spiritually. To illustrate: we can think back to ourselves physically as babies, as children – we can see we’ve changed, we bear no resemblance to that baby or child we once were, although on a daily basis that change was imperceptible. It’s the same with our spiritual growth; every time we sit in meditation we’re changing, even if on a daily basis that change is also imperceptible. We’ve no idea what’s going on at a different level, we’ve no idea how far or how close we are to lifting the veil of maya. Our part is to do exactly as we’ve been instructed – live within the confines of our promises, put in our effort and still more effort; do our very best, and leave the rest to him. If we carry on looking in the wrong direction, how will we see him? It’s rather like looking everywhere for our spectacles until we realize, they’re on our nose and they were there all of the time! Shabd has been there within us, all of the time, even closer than those spectacles on our nose – we just don’t see it! And because we don’t see it, this meditation may seem nothing more than two and a half hours of daily life. Yet slowly and subtly, meditation seeps into every aspect of our day. We begin to find joy, peace and contentment growing as we turn within. Our days reflect an expanding need, the need to know the inward way of truth. Longing begins to grow, fed by the increasing heat of love burning within. Every day, every moment, by accepting the Master’s help, we have a choice – to go inward to the Shabd or outward to the world. We can choose to die to self or to live to self. We begin to see that the real purpose of life here is to die to live and realize that true love that lasts forever. The saints and mystics say we need to wake up! To rise to the single eye before death overtakes us; to come alive to that everlasting peace and bliss. We may feel that this is way beyond us, we may feel trapped by our problems and weaknesses, but keeping within the bounds of the four vows, and living our daily lives in the atmosphere of meditation is the remedy, our essential healer. But at last he is drawn to the KING of love. Just as a twig, when grafted to a tree, becomes one with the tree and the life and energy of the tree become a part of the twig – in the same manner, those who have connected themselves with the Lord are completely one with him. And without a doubt I am his at last. In letter number 14 of Spiritual Letters, Baba Jaimal Singh writes: “The blessing conferred by the Satguru cannot be undone by anyone. So what is left for you to worry about? You reached Sach Khand the very day you were initiated.” The gift of initiation into the path of Surat Shabd Yoga by the living Master of our time is constant and eternal. No matter if we try to deny the gift by our actions and behaviour, no matter how rarely we thank the Satguru for the gift, no matter what we do, his gift is permanent. We are of different backgrounds, ages and personalities yet we share the most intimate relationship possible – disciple to Satguru. Our inner world is rich with light and sound even if we are not yet able to experience that joy. Sons, daughters, mothers, fathers, property and wealth are all unreal and will fade into the darkness of memory. If something is destroying our balance today, tomorrow it will become ancient history. “Within his will” – our whole journey on the path is his will. What a comforting fact. All that we go through – our successes and failures in life as disciples – is all his will. Everything that happens to us is leading us closer to him. Behind the obvious dualities of life, behind what seems good or bad to us, painful or joyous, is his constant will, edging us closer to the eye centre. Merging with our beloved, becoming one with him is our destiny. This process is happening now. But we need to be active partners in this journey. Our efforts in bhajan and simran please him. Our effort to live a positive moral life pleases him. Our role as a disciple is not a passive one but an active one. As disciples we need to be disciplined, in order to cultivate that atmosphere of gratitude which motivates us to further effort. Baba Jaimal Singh writes: “The Guru is ready to ferry you across the ocean of the universe.… The Shabd-dhun, which is always resounding within your body, will never forsake you. Hold on to it. Have absolute faith that it will not rest until it has taken you to Sach Khand.” Our future is laid out before us. It is time to stop worrying about this and that and give our time and attention to the path. We often get confused because we think of Sach Khand as a castle in the air and not as Shabd. As long as we imagine it to be a far-off place we are trying to get to, then it will remain an unreachable goal. But if we realize that our destination is inside and already part of who we are, then it seems less distant. Shabd is as close to us as the hair on our head. We are, in fact, Shabd. Our body will turn to dust but that drop of Shabd inside us is eternal. We lose sight of the possibility of success, of contentment, because we dream of the realm of peace and quiet as a distant castle. It is here, now. It is inside us – if we would only make the effort to experience what is true instead of focusing on the temporary. We should use our doubts to force ourselves to intensify our simran. We all have doubts. It is impossible to understand who the Satguru is and it is equally impossible to understand Shabd. We might be able to understand them intellectually, as concepts, but do we know them? Have we experienced the truth of the Satguru, of the Shabd? Until we experience them directly we will always have doubts about the truth of the path. Having doubts is a healthy thing, because our doubts can push us towards experience. We might still feel lost in a dark forest, drowning in an ocean of dread because our karmas seem heavy and the way through them is painful and unclear. We worry about the future because we are still attached to what will happen to us, what is in store for us next. We lose sight of the big picture. There is a path through the dark and scary journey of life. It is well lit and we are walking it hand in hand with our beloved. Storms might be raging around us and in us but all is well. He is as near to us as he can be, guiding us home. We have been given the greatest of all gifts – the Satguru. He is ours forever. Loving, alive, inside us. We will become one with him and there will be an end to our wanderings in this world and the pain of separation and loneliness will be ended by the embrace of our beloved. Pain and pleasure, my son, are the consequences of our own actions, and the karmas from the past, the fate karmas, will certainly produce their consequences. So in pain or pleasure one should not become unduly perturbed. Fix your love in the Shabd-dhun all the time…. There is not a touch of pain in the land of Shabd-dhun. No doubt, all of us from time to time feel that our spiritual goal is utterly beyond our reach. We wonder, given our worldly natures, how we could ever reach to higher levels of consciousness. Even after years on the path, we are for the most part still just like little children lost in the dark. We are desperately in need of a helping hand, a light to guide us. But one thing we do learn is that when we keep close to Master in our hearts, our sense of weakness diminishes and we can handle things better. No matter who we are, no matter the circumstances, our happiness always seems to be linked to our ability to maintain contact with the Master. When we turn our backs on the path, the light goes out of our lives. Sadness and anxiety increase. So, no matter how deep our knowledge of Sant Mat, no matter how long we have been initiated, it simply comes down to whether or not we are consistently tuning in to the Master in our thoughts and actions. When we think of him, or are in his presence, the Master radiates such strong currents of spirituality that we cannot help feeling love and uplift in our hearts. But, as we learn from experience, the duration and intensity of these feelings depends on our attitude and receptivity. We can only maintain that inner contact when we are living according to his wishes. Our behaviour can definitely disrupt the flow of grace. On one level, we seem to be completely powerless, but at the same time it is clear that our relationship with the Master gives us access to him in a very special way. When we approach him with sincerity, with a genuine desire for improvement, we provoke his grace. We have the means, in effect, to tap into unlimited spiritual resources. Initiation has empowered us more than we can imagine. It is as though we are surrounded by a great cloud of energy. Grace is all around us in abundance. But it remains invisible, or at best barely perceptible, until we send a tiny spark of genuine interest in its direction. As soon as we turn to the Master with love, with a true desire to be forgiven and to be loved, the response is tremendous. Powerful currents of spirituality immediately flow towards us, touch us and uplift our consciousness. It may take us years to realize it, but our relationship with the Master and the Shabd is, in fact, extremely personal and intimate. It is our inner motivation and feelings (not the position we hold, or think we hold, in the world, or the sangat) which determine our spiritual progress. This relationship is a love affair of the deepest kind. In Spiritual Perspectives, Vol. II, it is expressed beautifully by Maharaj Charan Singh: “Just as a child is brought up, stage by stage, at every step, so similarly a new initiate is brought up. His spiritual development takes place under the care of the Master.” After all, what are our feeble efforts to focus on the Lord in meditation, but the hand of the infant reaching out to touch the mother, calling for her love? What is his grace, but the mother’s caring touch, protecting and looking after her child? And in matters of love, as we all know, it is our feelings which count, and the attention that we give to the other person. Naturally, we are all going to make mistakes along the way. But, surely the trick is not to be blind to our shortcomings. We should develop the habit of quickly and easily admitting our faults and then moving on. Also, when we get off track, the greatest blessing is to have someone around who can help us see the spiritual side of things. And for this reason we should all try to help each other to behave positively. The worst thing we can do is to reinforce each other’s negative responses to situations and encourage back-biting and gossip. We can definitely be helpful by refusing to be drawn into negativity, instead helping each other to focus on the Master. Being spiritual means being positive. Really positive. We have to make a special kind of effort if we want to get anything out of this path. It requires courage to take things spiritually rather than personally. The worst trap is to say to ourselves that conditions are not yet right for meditation. Instead of sitting on the fence, complaining about our lot, about how weak we are, we have to do whatever it takes to practise Sant Mat. Our effort is the key to success. By returning time after time to the Master in our hearts, we begin to feel that strength and to experience a sense of personal freedom which is beyond description. This is a revelation which, like light to the soul, brings an appreciation of what a great mine of happiness and bliss is to be found within ourselves. A water-bearer used two large pots hung at each end of a pole that he carried across his neck. One of the pots had a crack in it, the other was perfect. The perfect pot always delivered a full portion of water at the end of the long journey from the stream, while the cracked pot arrived only half full. Daily the water-bearer only delivered one and a half pots of water to his master’s house. Naturally the perfect pot was proud of its accomplishments, but the poor cracked pot was ashamed of the imperfection that made it leak half the load of water it was meant to deliver. After two years of feeling a bitter failure, the cracked pot spoke to the water-bearer by the stream. Indeed, as they went up the hill, the old cracked pot took notice of the sun warming the beautiful wild flowers along the side of the path and felt cheered by the sight. But at the end of the trail, it again began to feel ashamed, as it had leaked half the water and again apologized to the water-bearer for its failure. lacks a pathway to you. He can go down into the lowest of low places and find people. He can stand in the highest of high places and see meaning; he is in contact with all beings. That which is not, he travels on. That which moves is what he stands on. Great is small for him, long is short for him, and all distances are near him. God took a walk on earth and decided to hold a party for the blessed. From his beautiful tent, invitations were sent out by his PA. The PA hadn’t liked to ask God who exactly the blessed are – he felt it was something he should know. So amongst those included were the prime minister and several MPs, a number of religious leaders, members of the royal family, a well-known charity benefactor, a business magnate, a university professor and a television presenter. In a sense, the PA was right. These people did indeed feel blessed – blessed by their own hard work or ability, blessed by good fortune or a devout nature or public acclaim. In fact, they were so busy enjoying their feeling of blessedness, or working to maintain it, that they hadn’t time to attend God’s party. One by one the replies came in, declining the invitation. Mr Selfish, Miss Sceptical, Bill the bully, Jim the intellectual gymnast, Mrs Busybody, Mr Flibbertigibbet and Mr Greedy. There was no time to run the arrangements by God. The party was due to start in a few hours. The tables were laden with delicious refreshments, musicians struck up, the guests arrived and were seated, and then God made his appearance. Mr Selfish was busy elbowing his neighbour out of the way. Bill the bully was scowling and flexing his muscles. Miss Sceptical was whispering, “I suppose he’s hoping to get something out of us”. Jim the intellectual gymnast had jumped up, notebook in hand, crying, “I’ve a few questions to ask”. Mr Flibbertigibbet wasn’t even seated – he was examining the cutlery, the crockery, the light fittings, the serviettes and the drapes. Mrs Busybody was asking where the cakes had come from, how much they had cost, whether God would like her recipe for cake, whether there was a Mrs God, and if so where she did her shopping. And Mr Greedy was a painful sight with his mouth stuffed with two kinds of delicacies. “Do they really not understand who they are with?” wondered the agonised PA. But God seemed quite unconcerned. He strolled around the table, patting one guest on the back, smiling to this one, joking with another. Afterwards no-one knew exactly how long the party had lasted. Was it a short time? Was it hours? In any case, eventually the shadows lengthened and the PA reminded God that he had to get back to heaven. Mr Selfish stood aside and let the others go in front. Miss Sceptical said goodbye and thank you with tears in her eyes. Jim the intellectual gymnast was totally silent but with a wide smile on his face. And Mr Greedy, after squashing the last iced cake into his bag, changed his mind, took it out, and replaced it on the table. Now of course I’m not saying that they were changed forever. No – but the memory of that afternoon stayed with them for a long, long time, and perhaps it was from that day forward that they were all less, well, what they had been. “Oh God!” said the PA as soon as God was out of earshot. Praise the Lord! Praise, O servant of the Lord! If we study the teachings of any saint, we will find that each one praises Nam or the Name of God. We have many religions and each has its own rites and rituals, ceremonies and formalities; but the reality, the essence of the truth and spirituality at the base of each one of them is the same. We praise because we are inspired and because we sense the presence of something so much greater than ourselves. We praise but we do not necessarily understand. A child may praise his teacher because he is kind and can answer all his questions – but he does not understand the depths of his teacher’s knowledge. We may praise a musical performance or the musician – but we do not necessarily understand the complexities or the skill involved in making that music. We praise because we are moved, because we find something or someone beautiful. We praise what touches us, regardless of our understanding. So too, we praise the Creator and the skill that has wrought the creation, because it fills us with awe. We perceive its grandeur even if we do not understand its source. No one can create colours like him; no one can create designs like him – there is no craftsman like him in this world. Many astonishing marvels has he created – unparalleled, grand and infinite. In the water, earth, air and sky, behold them and enjoy their beauty. Mystics tell us that the name of the Lord does not belong to any one language. There are so many languages, which language would it be? Holy men have mentioned two kinds of names. One is the external name which can be spoken or written.… The second Name is the unfathomable, imperceptible and secret Name, which emanates from the Lord himself. This is similar to the point made by Maharaj Charan Singh in the quotation given earlier – that the real Name praised by saints is “the essence of truth and spirituality”. Just as the outer name is simply a shell, so too the teachings of the saints, given to us in spoken and written words, are not an end in themselves but a beginning. The teachings are given to inspire us to please the Lord and truly offer our praise to him. It is like when we ask our friend to play a game. We can talk about that game – but talking about it is not the same as playing the game. Words just point to that game, that enjoyment of being with our friend. In the same way, we only start doing the real thing when we attend to the practice taught to us by the mystics. All the books, all the thoughts in all of our devotional literature, are just pointing towards playing that game of love with the Lord. If we don’t move on to the practice itself, it is like someone pointing at a beautiful sunset – and instead of looking at the sky we keep looking at their finger. They point, they say, “No, there – look, see the beautiful sky,” but we keep looking at their finger! The Lord’s true name is not mere words, but is something else which dwells in the inner recesses of our being. There are sweet and enrapturing melodies in it which can be heard. There is light in it which can be seen. This Name, Word or Shabd, relates to that unspoken, divine utterance that brought the creation into existence and sustains it even now. It is this audible life stream or sound current, ever resounding within us, that the mystics praise, and urge us to contact and experience through meditation. They come to teach us the technique that will enable us to offer true praise and devotion to the Lord and obtain supreme bliss. To make this possible, they teach the course of simran. Simran is not just a repetition of words with our mind. Simran is the first step in reaching out to the Lord. First we attend to our simran, then to listening to the sound. First the glass is cleaned, then it is filled – then we can drink. Or we might think of it in terms of a relationship in the physical world: words, whether written, spoken or sung – our love poetry and love songs – are only a prelude to loving. Two people get to know each other, tell each other about themselves, try to understand each other. They profess their affection, their devotion, their commitment, their desire to make a life together. But all these words are only a prelude to the long-term experience of loving. The outer words of simran are given to help achieve concentration, and through this concentration we contact the pull of the sound current which will carry us back to the Lord. Meditation allows for the true conversation between the Lord and the devotee. Eventually we rise above the words through love. It is through love, and not the words, that we attain complete union with the divine. True praise of the Lord is to meditate on Nam, the Name or the Word, the dynamic power of the Lord. Meditating on the Name is truly reflecting on God’s greatness. Meditation on the Name is true meditation, and it is true knowledge and wisdom. The passage goes on to explain that: “We must not get stuck in outward praise. If you want to sing the true praise of the Lord, then concentrate your attention on Nam within.” This is because ultimately it is not possible to praise the Lord with words – his love is something that cannot be expressed or comprehended by speech. It has to be experienced within. Ignorant persons think that God lives beyond the skies or beneath the depth of the oceans. Great souls realize him in their hearts, and perfect saints see him everywhere, both within and without. Saints and holy men say that he pervades the entire universe and that the universe is in him. Many of us love the sunshine; we love the warmth. Nothing grows without sunlight. Even the moon’s light is dependent on the sun’s rays. In England the most popular conversation is the weather. Because it’s so variable, how much or how little sun is expected is of constant interest. But wherever one is in the world, the sun seems to be the centre of life here on earth. People flock to beaches and holiday venues to soak up the sun, to get that “feel good factor”. This helps some relax and unwind and gives many people something to look forward to when their lives feel dark. And yet, the spiritually minded have always realized that the physical sun is not enough to bring true relaxation and joy. In fact, many gurmukhs spend long hours meditating in dark rooms so that the outer light does not distract from their concentration on their journey towards the inner sunshine. Baba Jaimal Singh meditated in a dark hut on the deserted banks of the Beas River in India for many years to experience the inner suns, until he eventually reached the source of the light and sound that created and sustains the entire creation. He then initiated many souls trapped in darkness and showed them the way to the never-fading sunshine, the source of love. One grey, cold and rainy day in England, when Baba Ji was giving satsang in the tent at Haynes Park, a young man got up and complained that he had no love for the Master or the path. Baba Ji laughed and told the man that he could have chosen to be on a beach somewhere soaking up the sun instead of freezing in this miserable cold tent … so he must have some sort of love! Only the Master’s grace pulls us to his outer and inner satsang and seva. Often we have to discipline ourselves to attend to these; we deliberately turn aside from outer luxuries and hobbies to reach towards the love, security and warmth of the Master. This self- control will always move us closer and closer to the source of love, light and happiness. The answer from Baba Ji to the honest young man could be taken as a message to all of us, to teach us not to chase after physical warmth in the world at the cost of meditation, satsang or seva. How can devotion to the Master ever compare to the momentary, pleasing sensation of the sun on our skin? For many initiates, a realization eventually dawns, that sitting in the sun (i.e., enjoying the pleasures of the world) is not enough to still the mind and senses. It isn’t enough to fill the yearning in our heart to find love and connect with God. No matter how beautiful the day is, we will still feel restless and empty without our mind focused on our beloved Master. As we do more meditation, we naturally begin to choose to retreat to the quiet cool ‘shade’ of life, to the stillness more conducive to meditation. As soon as our simran, dhyan and bhajan deepen and grow, Master graces our lives with his presence. We are in the comfort of his sunshine. Whatever the weather, the gurmukh enjoys the radiance of his Guru’s love. He is indifferent to outside circumstances. A Gurmukh is not much attached to worldly people. He does not crave or care for pleasures or enjoyments, nor does he long for sight-seeing and amusements. 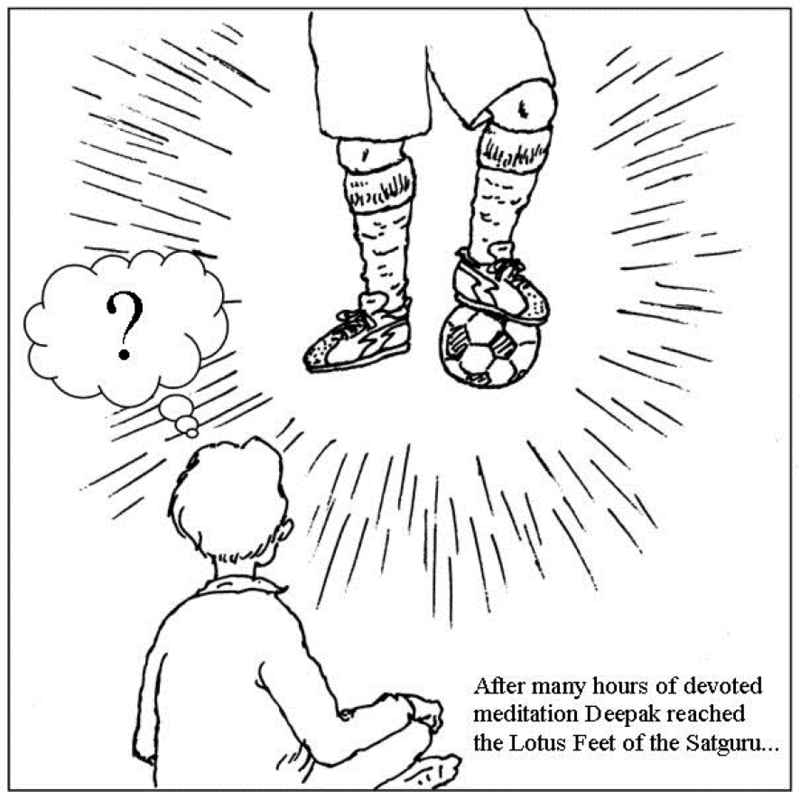 His only desire is to be at the Feet (of the Sat Guru), and he remains absorbed in that bliss. Now in a new edition, which re-translates the poems of earlier editions and increases their number, this book describes the life and teachings of the bhakti mystic Tulsi Sahib (1763-1843). Tulsi was a Brahmin by caste and the eldest son of the Peshwa or de facto king of Pune. But he became disillusioned with the affairs of the world, abruptly renounced his princely heritage, and left his home to seek God. He wandered throughout India for many years before settling in Hathras, about 35 miles north of Agra. Attaining inner realization, with courage and honesty he conveyed to all a message of hope – that the gift of divine grace and love overcomes all our imperfections. His writings emphasize devotion to the Master and the practice of Surat Shabd meditation. The parents and family of Seth Shiv Dayal Singh, known as Soami Ji, the founder of the Radha Soami line of masters, were closely associated with Tulsi Sahib. Soami Ji himself was close to Tulsi Sahib from childhood until Tulsi’s death. Tulsi Sahib revealed that he had earlier incarnated as Goswami Tulsi Das (1532-1623), and in that birth was proud of his social status and had desired a life of indulgence. “All the things of this world greatly appealed to me; arrogance and pride of lineage filled my mind.” But then God in his grace showed him another way, and, “an intense desire arose in my heart to meet a saint and follow him.” His wish was granted; he met a saint who connected him to the deep resonance of the Shabd or divine inner sound. and concealed the Ghat Ramayan. I put in writing what I witnessed within. I too extracted the true essence. Although he never names his own Master, Tulsi Sahib continually extols the benefits of having one. Who will light up the path leading to the Friend. His grace will kindle love for the Beloved in your heart. So that the Beloved becomes aware of you. The charming Beloved dwells within this beautiful body! And see who is right there! O Tulsi, we have come to quarrel with you! So elucidate the methods discussed in the Vedas. Bestow your grace upon me, O merciful ones! These teachings reveal the unspoken tale. We have remained ensnared by the web of karma. and have clarified all the teachings of the Vedas. You have now opened our eyes to the truth. Cleanse the sanctuary of your heart to welcome the Beloved. The path to reach your Beloved passes through the Royal Vein. understand the way to reach the Royal Vein. to reach Allah, the Greatest of All. Passionate mystic and ardent lover, Tulsi reveals to us the splendour and glory of divine love, all attained through the grace of Satguru and Shabd. It pecks at pearls on the banks of the sacred pool within.